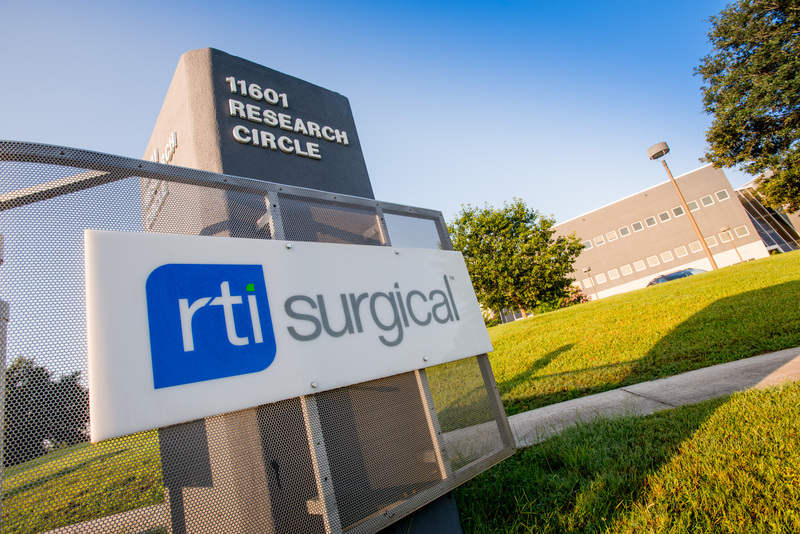 RTI Surgical® Announces Commercial Launch of Fortilink®-TS and -L IBF Systems with TETRAfuse® 3D Technology - RTI Surgical Holdings, Inc.
ALACHUA, Fla. – June 12, 2018 – RTI Surgical, Inc. (Nasdaq: RTIX), a global surgical implant company, announced the full commercial launch of its Fortilink®-TS and -L IBF Systems, adding to a growing series of interbody fusion devices featuring proprietary TETRAfuse® 3D Technology. The Fortilink-TS and -L Systems are intended for use in lumbar interbody fusion procedures at one or two adjoining levels in patients with degenerative disc disease. TETRAfuse 3D Technology is the first 3D printed polymer-based interbody fusion device to incorporate a nano-roughi surface that has demonstrated, in a pre-clinical study, more notable trabecular bone ingrowth compared to PEEK and titanium-coated PEEKii. John O’Toole, M.D., M.S., Professor of Neurosurgery at Rush University Medical Center in Chicago, Illinois, and one of the first surgeons to implant the Fortilink-TS device, added, "The introduction of TETRAfuse 3D Technology revolutionizes the interbody device market by combining a favorable modulus of elasticity, optimal imaging characteristics and a surface design promoting vigorous bone ingrowth. I believe TETRAfuse 3D Technology meets all the criteria for an interbody through enhanced biology, biomechanics and ease of use to help improve outcomes for patients." RTI commercially launched its first implant using TETRAfuse 3D Technology, the Fortilink-C IBF System, in October 2017. It is used as an interbody fusion device in anterior cervical discectomy and fusion (ACDF) surgeries. All Fortilink implants have received 510(k) clearance from the U.S. Food and Drug Administration (FDA). For more information about the Fortilink series of devices and TETRAfuse 3D Technology, visit www.tetrafuse3D.com. iv Donally C, Dulebohn S. Lumbar Degenerative Disk Disease. StatPearls. Oct 2017. Online at https://www.ncbi.nlm.nih.gov/books/NBK448134/. Last accessed May 25, 2018.
v Allegri M, Montella S, Salici F, et al. Mechanisms for low back pain: a guide for diagnosis and therapy. F1000Research. Oct 2016. Online at https://www.ncbi.nlm.nih.gov/pmc/articles/PMC4926733/. Last accessed May 25, 2018.
vi Manchikanti L, Singh V, Falco FJ, et al. Epidemiology of low back pain in adults. Neuromodulation. 2014 Oct;17 Suppl 2:3-10. Online at https://www.ncbi.nlm.nih.gov/pubmed/25395111. Last accessed May 25, 2018.
vii Licciardone JC. The epidemiology and medical management of low back pain during ambulatory medical care visits in the United States. Osteopath Med Prim Care. 2008; 2: 11. Online at https://www.ncbi.nlm.nih.gov/pmc/articles/PMC2631527/. Last accessed May 25, 2018.
viii Phillips FM, Slosar PJ, Youssef JA et al. Lumbar spine fusion for chronic low back pain due to degenerative disc disease: a systematic review. Spine (Phila Pa 1976). 2013 Apr 1;38(7):E409-22. Online at https://www.ncbi.nlm.nih.gov/pubmed/23334400. Last accessed May 25, 2018.